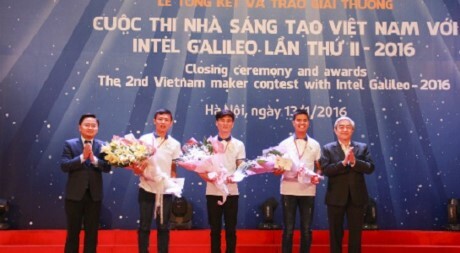 On the evening of 13.1, the Center for Science and Technology Development and Young Talents (Central Union) held the 2nd Vietnam maker contest with Intel Galileo 2016 at Vietnam National University, Hanoi. The contest was launched in early June, with the participation of 110 ideas for contest registration from 29 universities and institutes. The jury selected the 42 best ideas for the preliminary round. After 3 months of implementation, 16 best works of 41 students from 14 universities and institutes nationwide were selected for the final round. With the product "Robot supporting the elderly and the disabled", three students Nguyen Phi Lan, Le Ngoc Hoang and Tran Nguyen Phuc from Dong Nai University of Technology won the first prize. This robot can become a wheelchair to move, or can be turned into a bed so that the user can sleep or lie. At the same time, the robot can be lifted or lowered in a certain area so that the user can move from the robot to the bed without help from other people. Tran Nguyen Phuc, the leader of the group, said that the inspiration behind the creation of the product originated in the pictures of homeless people with manual disabilities in the country and videos of famous physicist Stephen Hawking in a wheelchair. From that image, the team came up with the idea to create a robotic car with a variety of features, low cost and easy to use to support the elderly and the disabled. Mr. Nguyen Anh Tuan, Secretary of the Central Youth Union, said that the products exhibited creative thinking, working ability of the group, attention to issues of information technology and communication in their daily life. According to Tuan, the products won this year are impressive because of the application and the ability to deploy in practice in all areas. The products not only show the quality of creativity but also express the feelings and responsibility of Vietnamese students towards the care of disadvantaged groups in society.